Gamma-ray bursts (GRBs) are energetic explosions observed in distant galaxies, characterized by a rapid flash of gamma rays lasting from a fraction of a second up to several hundreds of seconds. In this brief moment they release a spectacular amount of energy - more than the Sun will emit in its entire life - and they outshine their entire galaxy. Luckily for us, they are very far away, so they pose no threat to Earth. GRBs are associated with both the merging of two neutron stars (or a neutron star and black hole) and the deaths of massive stars. 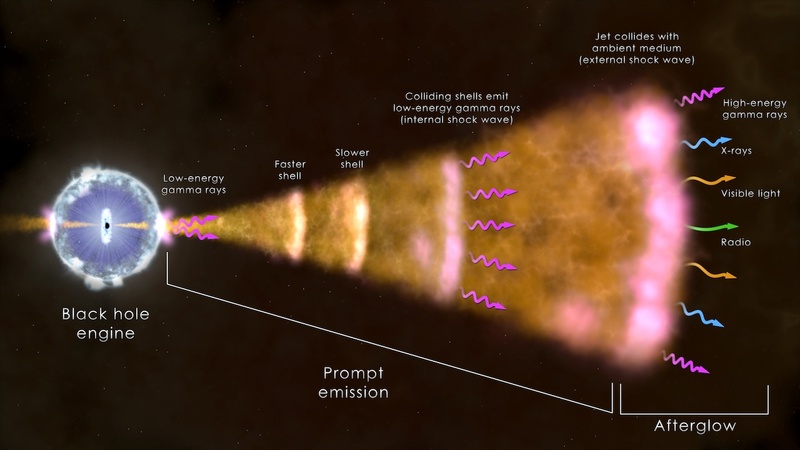 The prompt emission, the initial rapid flash of gamma rays, has typical peak energies of hundreds of kilo-electron volts (keV), where the Fermi Gamma-ray Burst Monitor (GBM) is most sensitive. GBM is the most prolific detector of GRBs to date, with 1 GRB detected every day or two for a total of more than 2000 over the last 10 years. GBM has a very wide energy range (8 keV to 40 Mega-eV, or MeV), allowing it to study the origin of the prompt gamma-ray emission. However, scientists are still debating the mechanisms that accelerate particles to gamma-ray energies. The Fermi Large Area Telescope (LAT), captures gamma rays with energies higher than 30 MeV up to energies of several hundreds of giga-electron volts (GeV). Because of the slightly smaller field of view and the different energy range, the LAT detects GRBs at a rate of approximately one per month. The LAT tends to detect only the brightest GBM GRBs. Nevertheless, after ten years of surveying the sky for an ever-deepening view of the gamma-ray sky and sources that vary on timescales of seconds to years, LAT has detected more than 150 GRBs at energy above 100 MeV. These observations have led to many discoveries, including that the high-energy emission is not simultaneous with the low-energy emission detected by the GBM. In fact, the highest-energy events detected by the LAT during a GRB do not come during this initial phase, but in the minutes to hours afterwards. This suggests that most energetic particles (needed to produce the highest energetic photons) are not accelerated during the prompt phase, but rather during the so-called afterglow. Afterglows are detected across the electromagnetic spectrum from radio to optical to X-ray to gamma-ray energies, as they fade over minutes to days, and even years in a handful of extreme cases. The onset time and also the much longer emission detected by the LAT (with respect to the prompt emission detected by the GBM) suggest that at least part of the high-energy emission is related to the afterglow phase. The afterglow emission is produced by the blastwave from the GRB jet running into the gas and dust surrounding the progenitor star. Interestingly, high-energy emission has been observed in both short-duration (neutron star merger) and long-duration (massive star collapse) GRBs. The brightest high-energy GRB ever detected by Fermi was GRB 130427A, with >100 MeV gamma-ray emission lasting for almost an entire day, and with gamma rays detected up to ~100 GeV. Short-duration GRB 090510 is still the record holder for the brightest neutron star merger burst, with many high-energy gamma-ray photons detected over ~200 seconds. We have also used Fermi's observation of GRBs to test fundamental physics. GRB 090510 was used to set stringent limits on whether or not different energy photons travel at the same speed, a concept known as Lorentz invariance violation. Even a tiny variation in photon speed, when accumulated over the billion years it took the light to reach Earth, may be revealed by observing the timing properties of gamma rays at different energies during a short pulse of emission. 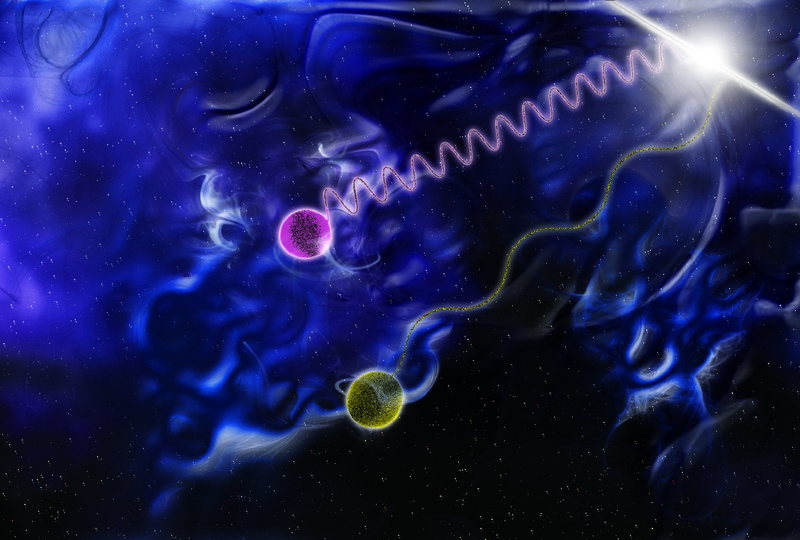 The Fermi limits were useful for eliminating some models of quantum-gravity. Please check back throughout August for more about GRBs including a post about what we've learned in the last year since the detection of a short GRB coincident with gravitational waves from the merging of two neutron stars.